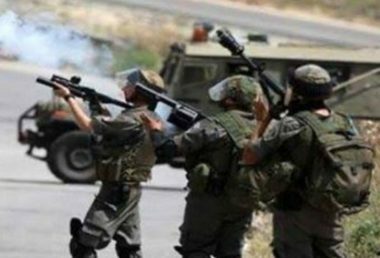 Israeli soldiers fired, on Saturday evening, many gas bombs and rubber-coated steel bullets at Palestinian protesters at the entrance of the al-‘Arroub refugee camp, north of Hebron, in the southern part of the occupied West Bank. The soldiers, stationed at the entrance of the refugee camp, fire many gas bombs and rubber-coated steel bullets at local protesters, who hurled stones at them. The soldiers also fired several gas bombs at homes in the same area, and completely sealed the refugee camp. 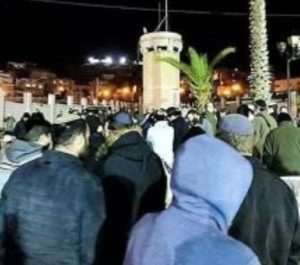 In related news, the soldiers installed a military roadblock at the southern entrance of Doura city, southwest of Hebron, stopped and searched dozens of cars, and interrogated the Palestinians while inspecting their ID cards. In addition, a group of fanatic illegal Israeli colonists gathered in the Sahla area, south of Hebron, and used loud speakers while chanting for killing the Palestinians and asking more colonists to join them. The incidents happened just short hours after dozens of colonialist settlers hurled stones at Palestinian cars driving at the junction of Gush Etzion colony, north of Hebron, and shouted insults and threats at the locals.